The Arnold Chiari Malformation constitutes the "herniation" of the Cerebellar Tonsils which are abnormally positioned below the Base of the Skull. The term "Herniation" means that a portion of the Cerebellum (the "tonsils") has been pushed down through the normal opening in the Base of the Skull (the Foramen Magnum) into the upper (or Superior) part of the Spinal Canal. For reasons that are explained elsewhere in this material, this can also cause Cerebrospinal Fluid (CSF) to be pushed down, under pressure, into the Cervical Spinal Cord's "Central Canal" to form an additional problem called a "Syrinx". A Syrinx is an abnormal, fluid filled, internal dilatation of the Spinal Cord's Central Canal. 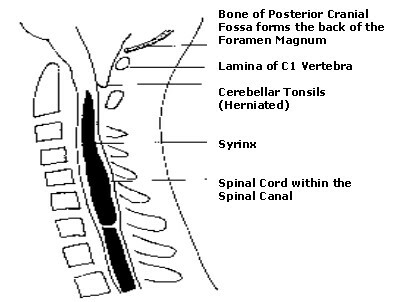 The diagram in Figure 1 represents the "Arnold-Chiari Malformation" as well as a "Syrinx" within the Cervical Spinal Cord. The Posterior Cranial Fossa is the portion of the Skull which houses the Brain Stem, Cerebellum, and Fourth Ventricle. Below this lie the bones (Vertebra) of the upper portion of the Spinal Column (the Cervical Region) which surround the Spinal Cord enclosing and protecting it in a bony tube (the Spinal Canal) in a manner analogous to the Skull protecting the Brain. The Spinal Cord connects to the Medulla above it and then on up to the rest of the Brain Stem. The Cerebellum is Brain's balance and coordination center as well as the control center for fine tuning smooth and coordinated movements of the entire body. The Cerebellum is generally regarded as "the back part of the Brain" and is located in the Posterior Cranial Fossa. It is composed of several parts. The center portion is called the "Vermis" which lies between the two (left & right) Cerebellar Hemispheres. The structures which hang from the lower end of the hemispheres are called the "Cerebellar Tonsils". These "Tonsils" are normally confined within the bone of the Skull. In the Arnold-Chiari Malformation, the "Tonsils" abnormally extend through the opening in the base of the Skull (the Foramen Magnum) and exert abnormally increased pressure on the Brain Stem as well as the upper portion of the Spinal Cord. The Fourth Ventricle is a fluid filled cavity that is located between the Brain Stem and Cerebellum. It is one part of a system (called "Ventricles") that processes the all important crystal clear, water-like, Cerebrospinal Fluid (CSF) which bathes, protects and nourishes the Brain and Spinal Cord. CSF is made, on a constant basis and at a constant rate, within this multi-chambered Ventricular System. The Fourth Ventricle is the last of the four fluid filled cavities within the Brain. There are also the "Third" and two "Lateral" Ventricles, which together with some internal channels, make up this system. All of the Ventricles communicate with each other through this channel system that lies within the Brain substance. CSF, after flowing through these channels, escapes the Ventricular System through special outlets located in the Fourth Ventricle. The CSF then circulates around the Brain and Spinal Cord and is constantly being reabsorbed through a unique system (Arachnoid Granulations) located over the surface of each Cerebral Hemisphere. The Arnold-Chiari Malformation is defined by the pathological downward extension of the Cerebellar Tonsils through the Foramen Magnum and into the upper Cervical Spinal Canal. The Brain Stem and Fourth Ventricle remain in their normal position within the confines of the bony skull as does the remainder of the Cerebellum. It is this downward displacement of the Cerebellar Tonsils that results in an excessive amount of tissue occupying the Foramen Magnum and the upper Cervical Spinal Canal. The cause of the Arnold-Chiari Type I Malformation is not known. While there are several theories regarding the genesis of this problem, it is not known for certain if this malformation develops before or after birth. If it is congenital, it probably forms between the third and sixth month of pregnancy. There are no known specific factors that may occur during pregnancy that can be linked to the Type 1 malformation. It does not appear to be a genetic or an inherited problem when it is found as a single entity. A familial tendency may play a role in certain instances when it is found in combination with some other types of abnormalities. This downward displacement of the Cerebellar Tonsils, through the Foramen Magnum and into the Superior Cervical Spinal Canal, produces undue pressure upon the lower Brain Stem as well as the upper Spinal Cord. Many of the symptoms and neurological signs (deficits) associated with this condition are the consequence of this pressure. See Table 1 for a list of those problems. One fact of normal Brain and CSF physiology may help the reader to understand the information that follows. The Brain actually "beats" in a rhythmic cycle directly related to one's heart beat. As the heart "beats", it pushes blood into the Brain. This causes the Brain to momentarily "expand". The alternating "contraction" and "relaxation" also produces a pressure "pulse" wave in the CSF which surrounds the Brain. With each "pulse" the pressure within the bony skull (as well as the Spinal Canal) alternately "increases" and then "decreases". In the context of an abnormal or pathological condition such as the Arnold-Chiari Malformation, this results in a rhythmic "beating" imparted to the Brain Stem and upper Cervical Spinal Cord. Over time, this can cause some deleterious effects on these vital structures. There are two additional problems, which are relatively uncommon, that may result from the interference with the normal circulation of Cerebrospinal Fluid through the Fourth Ventricle. When CSF encounters difficulty exiting the Fourth Ventricle it may result in a complete or relative imbalance in the rate at which CSF is reabsorbed. Since CSF is constantly being made, the failure to reabsorb the CSF at the same rate may cause the pressure within the Brain's Ventricles to increase considerably. The increased internal pressure can cause an expansion of the ventricles, a condition called "Hydrocephalus". This is similar in concept to an expanding balloon within the Brain substance resulting in injury to the Brain as it is compressed from the inside. 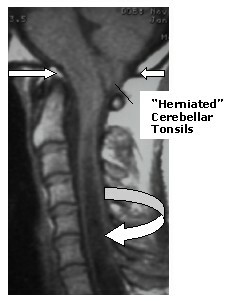 More common than Hydrocephalus (as a complicating factor in Arnold-Chiari Malformation), is a condition known as "Syringomyelia". (There are other terms applied to this condition that are used interchangeably by physicians.) These terms, Syringomyelia, Hydromyelia or Syrinx, all refer to an internal expansion of a normally very narrow channel (the Central Spinal Canal) which occupies a center position within the center of the Spinal Cord. If Cerebrospinal Fluid, as a result of the interference with its normal flow within the Brain's Fourth Ventricle, is abnormally directed (under pressure developed in the cyclical beating of the Brain) into this Central Canal of the Spinal Cord, it may dilate the Central Canal. This "hydrocephalus" of the Spinal Cord is called a Syrinx. The Syrinx may compress the surrounding Spinal Cord resulting in damage by internal compression which then may interfere with the normal functioning of the Spinal Cord. Syringomyelia may cause pain in the shoulders or weakness in the arms or trunk. There may be a change in the ability to "feel" in the upper extremities or trunk as well as tightness or spasticity of the lower extremities causing difficulty walking. The large Syrinx (Curved Arrows) extends from the C2 level down through the entire Cervical Spinal Cord. This patient exhibited significant neurological deficits related to this severe expression of this entity. She was treated surgically in a manner described below with an excellent outcome. Syringomyelia can also be associated with an abnormal "Curvature of the Spine", a condition known as "Scoliosis". It is important to recognize that when Scoliosis is initially identified, neuroimaging tests should be considered since the underlying cause of the scoliosis may be the presence of the Arnold-Chiari Type I Malformation. The presence of an Arnold-Chiari Type I malformation can also be detected on MRI scans done for other reasons such as when a patient is being evaluated for other Neurological problems such as a head injury or as part of the investigation of headaches. This malformation is sometimes associated with less common bony anomalies at the base of the skull and upper spine such as in "Basilar Impression". Spasticity and balance problems are usually a prominent feature in this condition. 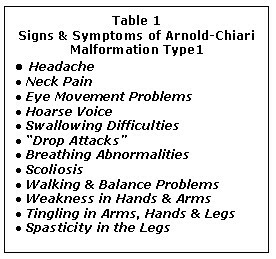 The majority of patients with the Arnold-Chiari Malformation develop their first symptoms in childhood or adolescence, although symptoms can occur at any age. Headaches and neck pain are the most common initial complaints. 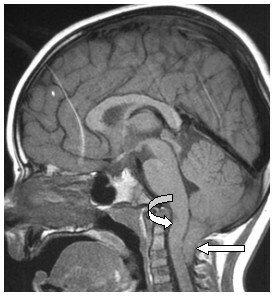 The diagnosis of Arnold-Chiari Malformation is best made on MRI scan (as depicted in Figure 2). An MRI scan is usually the only neuroimaging study that is needed since it invariably gives a clear picture of the anatomy of the Brain, the Spinal Cord and any other associated anomalies that may be present. Figure 3: MRI Scan (Sagittal View) of a young patient with Arnold Chiari Malformation. The Cerebellar Tonsils are "herniated" (Horizontal `	Arrow) through the Foramen Magnum into the upper Cervical Spinal Canal (as far down as the 3rd Cervical Vertebra segment). The Brain stem exhibits "kinking" (Curved arrow) which is another characteristic of a more advanced case of Arnold Chiari Malformations. Other neuroimaging techniques such as CT scan and myelogram, which were commonly used in the past, are rarely required nowadays because of the quality of and availability of MRI scanning. Other tests such as "electrodiagnostic" (EMG, NCV, BAER and SSEP) are rarely of major significance for patients who are symptomatic from an Arnold-Chiari Malformation. The majority of physicians would agree that an asymptomatic patient with an Arnold-Chiari Malformation should be observed over a period of time rather than subjecting them to a surgical procedure. NO NON-SURGICAL TREATMENTS ARE AVAILABLE FOR THIS CONDITON. Sequential Neurological examinations together with MRI scans over a period of years are usually all that is required for the asymptomatic patient. On the other hand, once the patient with this malformation becomes symptomatic or develops progression of neurological deficits, definitive treatment is required. The objective of any treatment is to stop the progression of symptoms and hopefully to relieve the symptoms. While it is acknowledged that there are a variety of approaches that can be used, our considerable experience has convinced us that treatment is best accomplished by an operation that results in the "decompression" of the Brain Stem, Cerebellum and Spinal Cord, along with the re-establishment of more normal Cerebrospinal Fluid circulation. A successful "Decompression" is achieved by surgically removing the bony structures at the back of the Skull that are compressing the Brain Stem and Cerebellum. The operation (called a Sub-occipital or Posterior Fossa Craniectomy) involves the removal of the bone from the back of the Posterior Fossa, called the "Sub-occipital bone". The outer covering of the Brain, (a tough leather-like substance called the Dura Mater) must also be opened and "expanded" by suturing in place an expansion "dural graft". This combined procedure results in the establishment of much more room for the Brain, Brain Stem and the Spinal Cord. Figure 4A (Left): MRI Scan (Sagittal View) Arnold Chiari Malformation in a 19 year old Female with 2 year history of progressively severe headaches worsened with straining and bending. The "Tonsils" (Horizontal arrows) are herniated through the Foramen Magnum (Curved Arrows). Figure 4B (Right): Operative Photo (same patient). The Dura is open to demonstrate the herniated "Tonsils". Figure 4C (Left): Operative Photo (Same patient). The Cerebellar tonsils (Horizontal arrows) have been "separated" to permit direct inspection of the Medulla and 4th Ventricle (Curved Arrow). Figure 4D (Right): Operative Photo (Same patient). A Dural decompression graft has been sutured in place creating a considerably larger "Foramen Magnum" region and relieving the pressure on the Medulla and Cervical Spinal Cord. Our experience (see below) with Arnold-Chiari Malformation has given us some unique insight into the methods to re-establish of Cerebrospinal Fluid circulation and to diminish the "water hammer" effect that appears to result in the formation of a Syrinx. We routinely microsurgically divide the tense arachnoid bands that have grown to hold the herniated Cerebellar Tonsils to the inside of the Dura Mater in the Foramen Magnum region and in the upper Cervical Spinal Canal. Once this is accomplished, we routinely microsurgically separate the Cerebellar Tonsils, in the midline, free up these arachnoidal band-like attachments to the upper Cervical Spinal Cord and then enter the lower to mid-portion of the Fourth Ventricle. Once this is done, CSF can escape the previously abnormal and confining environment, thus allowing for a re-establishment of a reabsorbtion pathway and the redirection of the CSF pulse wave away from the Central Canal of the Spinal Cord. This latter maneuver is extremely important, in our opinion and experience, in the successful treatment of most Syrinx related problems. While this may not entirely reverse the Syrinx and/or the symptoms, it usually aborts the inevitable progression of the Syrinx. 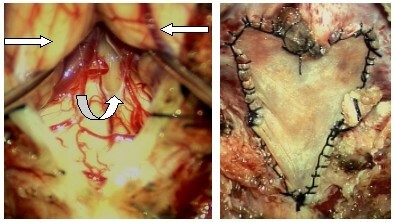 Figure 5A (Top Left): Operative Photo of a 20 year old male with Arnold Chiari Malformation. 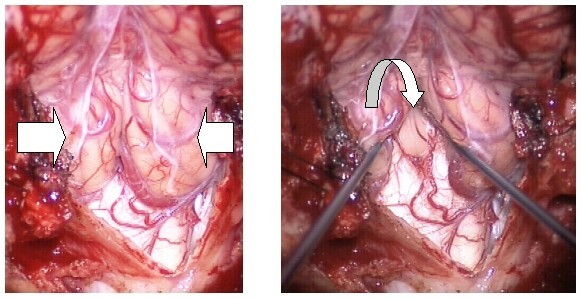 The Dura and underlying Arachnoid are open to reveal the Herniated Tonsils (Horizontal Arrows). 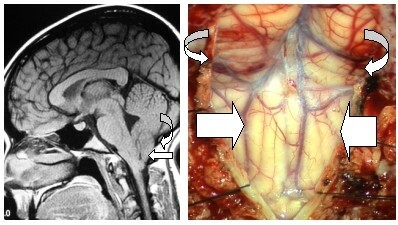 Figure 5B (Top Right): Operative Photo (same patient). The Cerebellar Tonsils are separated to reveal the 4th Ventricle (Curved Arrow) and the Medulla. We strongly oppose the concept of "amputation" or removal of the Cerebellar Tonsils as a method to decompress the Spinal Cord. 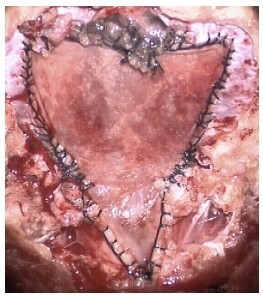 While "amputation" needlessly invades normal Brain substance, it also creates a greater risk to post-operative haemorrhage as well as scar formation which then can result in a late failure of the operation. It is imperative to realize that early and definitive treatment is fundamental to the successful management of patients who are symptomatic from an Arnold-Chiari Malformation. The chances for successful resolution of the myriad of neurological problems that can accompany this syndrome are lessened the longer that a symptomatic patient delays definitive treatment. The symptoms due to Syringomyelia are more difficult to completely resolve. The success here is inversely proportional to the extent of the Syrinx, the amount of Spinal Cord substance that has been destroyed, the extent of functional neurological impairment as well as the length of time of the neurological disturbance. It is for these reasons that early treatment is very important. In our extensive series of over 200 patients, some of whom have been followed for up to thirty (30) years, late failures or recurrence of symptoms is exceptionally rare. While there certainly is a risk that symptoms may come back after surgery, this must be quite uncommon.